Over the past few centuries the world has advanced in immeasurable ways. While this progression has had many benefits, it has created one major consequence. The world is running out of energy sources while simultaneously harming the environment and damaging political relationships across the globe. The globalized world is facing an enormous energy crisis today. It is proving to be so complex and multi faceted, that finding a plausible solution that will lead to the beneficial development of every country is looking more and more unlikely. It is just recently that economists, politicians, and environmentalists have come together and noticed that there is a substantial problem, and current actions are only bringing a cataclysmic time closer and closer. With every country in the world involved in energy on some level, albeit using it at different speeds and efficiencies, it is difficult to align each state towards solving this issue tat will ultimately bring a form of destruction to all involved if not worked on immediately and cooperatively. Regions across the world are searching for or finding new energy reserves, leading them towards profits, but also causing many political and long run economic collapses. Countries, specifically in the Middle East, have such power in reserves and prices of fossil fuel energies, that the rest of the world is forced to wait for their next move, as economy’s have become so reliant in energy. Wealthy powerful nations are plagued by their needy relationship to foreign oil and energy or the profits that sales bring in, while poor or unstable nations are being taken advantage of and exploited, left with nothing. Africa has been exploited for it natural resources, and relations with MENA have seemed to have only worsened over the past decade. With ever changing prices and limited resources, energy is one of the most important issues of our time as it has a direct influence on politics, the economy, and the climate. Focusing on these factors, the books “Rising Powers, Shrinking Plant: The New Geopolitics of Energy” by Michael Klare and “The New Energy Crisis: Climate, Economics, and Geopolitics” by Jean-Marie Chevalier examine the economic causations and possible political outcomes of our energy filled world. Conflict and tensions are arising as the new energy crisis promises social and financial repercussions. While both books focus were written within a year of each other and focus on the same topic, the new energy crisis, Klare and Chevalier take slightly different approaches in the way they present the information. Additionally, the concentration of regions and attention to politics vs. economics varies between the two books. Klare starts his Book “Rising Powers Shrinking Planet”, by describing how states have been altered over the past 100 years. He explains that as industry has boomed around the world, the needs of a country have drastically changed. In order to keep an economy and businesses running, the Westernized advanced world needs petroleum. This has led to fierce competition in which the fight for control of energy is becoming more intense. Countries are divided into “energy surplus and energy deficient nations” (Klare 14). The idea behind this is that in the new international energy order, a “nations rank will increasingly be determined by the vastness of its oil and gas reserves” (14). Klare then discusses the seeking more, finding less phenomenon. As the world needs more and more energy to sustain our current industrial and economic development, the current resources are being depleted and there countries are having trouble finding new reserves, leading environmentalists to believe that there is almost nothing left to find. As China and India, also known as Chindia, are proving to be emerging major consumers, their intake and stake in energy has increased substantially. China’s economic expansion has made it the second largest consumer of oil, only behind the United States. Klare then discusses where the majority of the reserves in the worlds are today: Russia, the Caspian region, and Africa and the Middle East. These countries have extreme power and other countries in need of oil are attempting to align themselves politically with a supplier. As a last point, Klare focuses in on America and its control of the Persian Gulf and it dominance in the Middle East. He claims other countries are encroaching on previously US territories, and that the tensions of gaining energy are leading toward military armed conflicts. The book ends with a suggestion to “avert catastrophe” centering on United States collaboration and “developing petroleum alternatives” (249). With similar points, Chevalier’s “The New Energy Crisis”, chooses to focus more on the environmental consequences rather than political, but comes to very similar conclusions as Klare. She describes the new energy crisis as a period of unsustainable energy use and how this has led to scarcity, high prices, and economic and energy inequalities. From the beginning, the book urges the importance of energy investment, citing it as the best option for risk management. Parallel to Klare, the book discusses China and India as a rising power, explaining that their largest form of energy use is coal. This is causing global repercussions in the hydrocarbon energy markets, as by 2030 Chindia will need to import over half of their needed gas (63). Taking an environmental stance, Asia will account for 56% of Carbon Dioxide emissions over the next 15 years, which will wreak havoc on the global climate. Discussed next is Russia and the Caspian Sea as Russia has the largest natural resource base. They have used their fairly newfound reserves to help diversify their economy and bring in revenue. However, the question of how long they can maintain these levels of production is unknown as the advanced technology needed to reach Russia’s uninhabitable cold and dangerous areas is proving to be very expensive and risky. The book then makes an interesting claim saying, “energy poverty is always associated with economic poverty” (115). Chevalier argues that poor countries do not have access to choice and thus are forced to use the most destructive energy choices, such as biomass and oil. In order for developing countries to gain access to all forms of energy in a sustainable way, the institutional framework must change, international investors must take interest, and the state must take accountability. 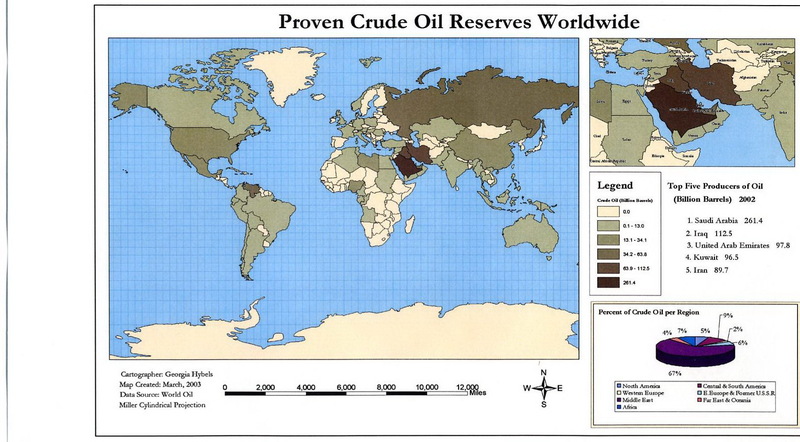 Looking at the Middle East, the book calls its oil reserves a blessing and a curse, as their economies are completely reliant on a nonrenewable resource. She then focuses on the United States and Europe, as they are working towards changing their energy framework, questioning the current approach being taken. Like the other book, she offers her suggestions and proposals for a better future looking at “the dynamics od interdependences”, “the potential role of technology” and “the need for better and stronger regulation” (Chevalier 257). From the two books, the topic that I found the most interesting was the significant and extensive role Russia plays in the energy game. Prior to reading these books, I was unaware that Russia has such large natural gas reserves and is coming forth as a major power economically and politically due to its resources. When one thinks about the new energy crisis, minds immediately jump to the Middle Ease and Africa, known for their oil and conflict. However, in today’s changing world with more and more people needing a piece of the action, new powers are coming forth adding to the competition, holding a distinctive advantage if they have access to natural gas. Writing about Russia, Klare explains that the country is “capable of leveraging its extraordinary resource abundance into immense geopolitical influence” (88). Although not a drastically popular nation from a Western point of view, the recent economic progression and development, primarily put into motion due to its oil and natural gas profits, has made Russia a force to be reckoned with. “Russia holds the world’s largest proven natural gas reserves, the second largest coal reserves, and the seventh largest oil reserves”, giving it great power, leverage, and responsibility (Klare 89). To diversify their efforts, they are also developing their hydroelectric potential. Because of its great resources, Russia is one of the few countries in the world that are self-sufficient, which is important and beneficial to them as they are rising on the charts in terms of energy consumption. Politically, Russia is very protective of its resources and calculated in their international transactions. According to Chevalier, following World War II and the collapse of the USSR, the nation was in economic shambles. The country was over reliant on fossil fuels but could not afford to purchase and import the necessary fuel. Then in the mid to late-1900’s a petroleum geologist moved to Siberia with the notion that the land was “floating on oil”: this would prove to be true and open up an entirely new industry. However in the 1990’s Russia was experiencing a recession and decided to privatize and liberalize the Russian oil sector. Unfortunately, this act did not bring in the necessary funds or investments needed for improvement (Chevalier 93). According to Klare, when Putin came to power the ruler held a much different view on the role of energy in the economy. He believed “in the crucial role of the state in the management of the country’s natural resource endowment and first expressed his thoughts on how energy production could contribute to the reemergence of Russia as a Great Power” (Klare 92). It was Putin’s beliefs that state oversight and ownership of the nation’s raw would serve in the best interest of the Russian people. From then on, Putin was very strategic in his political movements, and supposedly was responsible for the arrest of his business partner Khodorkovsky. This granted him access to “Yuko’s oil assets”, and when the shares were auctioned off they ended up back in Putin’s (the governments) hands, giving him and the state essentially all financial and directorial control. Russia’s next major move was to take control of Gazprom, “the worlds largest natural gas producer” (Klare 96). This importance of this company is that it works closely with the European Union and offers them about 25% of their total gas. Having ownership of Gazprom allows for lots of money to flow into the federal budget and helped to create ties and connections with countries in need of Russia’s energy. This was a monopolizing but very smart strategy for Russia, boosting their geopolitical front and the influence they would have when working with other states. As the rest of the developed world rushes to find new energy, the United States is skeptical of Russia, and does not want the leaders of the country to have the influence and power that energy brings them: mainly because they are working on opposite side ideologically and are currently have a very tense and unstable relationship. Seeing how energy can be so beneficial to a country, allows me to understand the weight in which our society and governments puts on it. If energy is so lucrative and is the key to economic and structural development, it is easy to understand the severe and brutal competition that is occurring. Even with depleting resources and the environment slowly yet surely being destroyed, traditional energy such as oil and fossil fuels remain the golden prize, despite the irreversible consequences. We are stuck in old ways, reluctant to move forward due to risk and uncertainty. The other interesting and new point that both Klare and Chevalier discussed was how little export diversification is coming from the Middle East and North Africa. Countries like Saudi Arabia and Kuwait have had successful history’s of focusing on their exports of oil, but as supplies begin to run low and no other resources have been found, they are facing financial unrest. Although these countries have OPEC which helps maintain oil prices and guarantee a profit, “the dramatic rise of oil prices has led to massive revenue transfers towards oil-exporting countries since 2004”(Chevalier 147), their single profit economies are destined to fail. Klare states that “major energy-consuming powers [are] growing leery of excessive reliance on the Middle East” (146). Chevalier refers to it as the oil curse, as even countries with oil-rich governments, have very poorly rated social systems and rank low on the Human Development Index. Because the oil is owned and controlled by so few people in an elite class, there is no trickle down effect from the profits. The people receive very little benefits from the wealth that their land and resources bring them. Thus, while a Middle Eastern country such as the United Arab Emirate’s and Kuwait have wealthy governments, their people and social structures are not getting any extra assistance or access to public goods. In order to fix this problem, MENA countries need to find other outputs and specialize in some other exportable good besides oil. Some environmentalists say that the world will run out of oil in as soon as the next few centuries: if this is true, there is little hope for these OPEC countries, unless they instigate intuitional change now, and allow themselves time to progress and develop. Overall, I enjoyed both Michael Klare’s “Rising Powers Shrink Planet: The New Geopolitics of Energy” and Jean-Marie Chevalier’s “The New Energy Crisis: Climate, Economics, and Geopolitics”. Each was very informative and helped me to understand new and foreign concepts. Focusing on the true international relations and politics of multiple countries surrounding the energy crisis, they provided interesting perspectives on causes, actions, and consequences. By looking to the past, present and future, they are able to offer an explanation to the current global crisis and an interesting evaluation of the tensions and motivations of different states. While similar in topic and conversation, I would have to say I enjoyed Chevalier’s “The New Energy Crisis” the most, as she was able to discuss the implications of geopolitical tension the most clearly. As for Klare’s book I felt that the writing style was not as straightforward. In many areas it seemed to jump around when talking about different countries, and its explanations of history were not always in direct chronological order. When reading about history, I feel that I am able to get a better grasp when it is talked about in a succinct way. Within each chapter, there were quite a few subheadings that helped narrow down the conversation, but I definitely felt like I was getting a lot of information in a very short space. Structurally, Klare’s book was much more specific and zoned in to much more detail than Chevalier. While this can be a good, as a reader who had limited knowledge about a lot of the information, it definitely seemed like one could get lost in the information and therefore struggle to find the main theme. One thing I did enjoy about the structure of the book was the supporting evidence it used to back its claims and arguments. All of the outside information seemed pertinent to what was being discussed, and helped to tie in actual representation, as he used statistics, quotes, and graphs. Finally, I strongly agree with Klare’s suggestions for the future. He doesn’t just suggest technology and working towards using less carbon dioxide producing energy forms, but rather looks at the organizational and structural problems of governments and institutions. Without support and collaboration from major players involved, the world may be unable to reach a successful conclusion, which will lead us towards darker times. Another reason I probably did not prefer Klare’s book to Chevalier’s, was because it took an overall more negative tone, stating from the beginning that the world will “produce intense competition among an expanding group of energy-consuming nations for control over…reserves of hydrocarbons” and “such moves, already visible on the political landscape, are a recipe for all sorts of conflict” (7). While this is probably the more realistic approach, it is disheartening to hear about such drastic problems but not about the actions being taken to try to reverse the harms. As opposed to Klare, “The New Energy Crisis” by Chevalier, offers current regulations that are being enacted to help stop climate change and foster communication throughout the book. Additionally, I feel that her view of America is much more optimistic than Klare’s. She see’s the United States in the midst of a “turning Point” while Klare presents America in a more domineering territorial way, naming the section “Encroaching on an American Lake”. Furthermore, I think this book does a better job as presenting different options and perspectives and is overall more objective. She is able to clearly communicate the dire environmental and geopolitical situation the world is currently in, while maintaining a very factual tone. Similarly, to the other book, her chapters are divided by specific regions, which is helpful to understand the different problems each are of the world is facing. Her analysis is also more clear and broad, making it much easier to follow. Overall, “The New Energy Crisis” did an excellent job is explaining the implications of the geopolitical tensions that have been caused by unsustainable practices. Reading these books, I couldn’t help but feel slightly frustrated. Even with the wealth of knowledge regarding their destructive behavior, regions and countries are not adjusting their priorities accordingly. So much tension and determination is being put toward building profit and finding new reserves, when in reality it should be put towards the future of the world economy and environment. Cooperation and collaboration will prove to be key in the relations between international players. Chevalier, Jean Marie. The New Energy Crisis: Climate, Economics and Geopolitics. Basingstoke: Palgrave Macmillan, 2009. Print. Klare, Michael T. Rising Powers, Shrinking Planet: The New Geopolitics of Energy. New York: Metropolitan, 2008. Print.